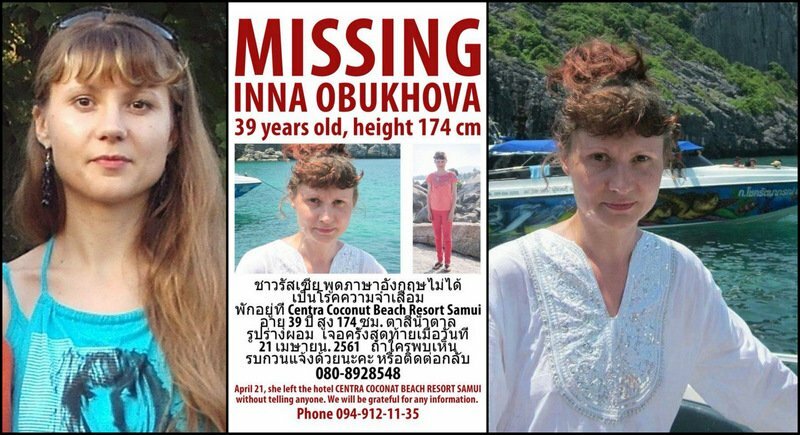 PHUKET: Relatives and friends of Russian national Inna Ibukhova, 39, have appealed to the residents of Phuket for help in their search for the woman, who went missing on Koh Samui in April but is claimed to be last seen in Phuket on May 11. The family of Ms Obukhova began their search on April 24, when the woman did not return from Samui to her home city of Blagoveschensk, in Russia’s Far East, as expected last month. Ms Obukhova was enjoying her Thai vacation on a package tour and entered the country using the visa exemption rule, allowing Russian tourists to stay in the Kingdom for 30 days. According to the publication in a search support social media group, Ms Obukhova’s permit to stay in Thailand should have expired last Saturday (May 12). In his online appeal, Ms Obukhova’s brother Valeriy Obukhov said that his sister stayed at Centra by Centara Coconut Beach Resort Samui and was last seen on April 21. The tourist left her room with her passport and cash only, leaving all her other belongings behind. “Please advise what we can do and how to search for her. She doesn’t speak any languages [except Russian] and previously said to be using a translation software in her phone to communicate with other people,” Mr Obukhov wrote. Initial searches on Koh Samui by rescue teams and the local expat community brought zero results. Ms Obukhova’s father arrived in Thailand several days after she had disappeared, but the only thing he could do was pick up his daughter’s personal possessions. The Russian Embassy in Thailand was informed of her disappearance, but as of April 27 had little information. “The search is ongoing but at this stage there is no information about her location,” Russian TV channel NTV quoted the embassy’s Head of Consular Section Vladimir Sosnov as saying on that day. The most recent post on the search assistance group claims that Ms Obukhova was seen in Phuket last Friday, May 11. The information was published on social media last night, May 16. “News number one! A policeman sent information from Phuket! A hotel security guard (the hotel will be identified later) is definitely sure that he saw Inna in Phuket on May 11. Please share this information in Phuket social media groups”, the post said. Later the hotel was identified as “a hotel at Phuket Boat Lagoon”. Ms Obukhova is described as 174 centimetres tall with blonde hair. She is believed to have no distinguishing physical characteristics or tattoos. Likewise, it is not known what clothes she may be wearing at the moment. Any persons who believe they have information that can help locate Ms Obukhova are urged to call 080-8928548 or 094-9121135.